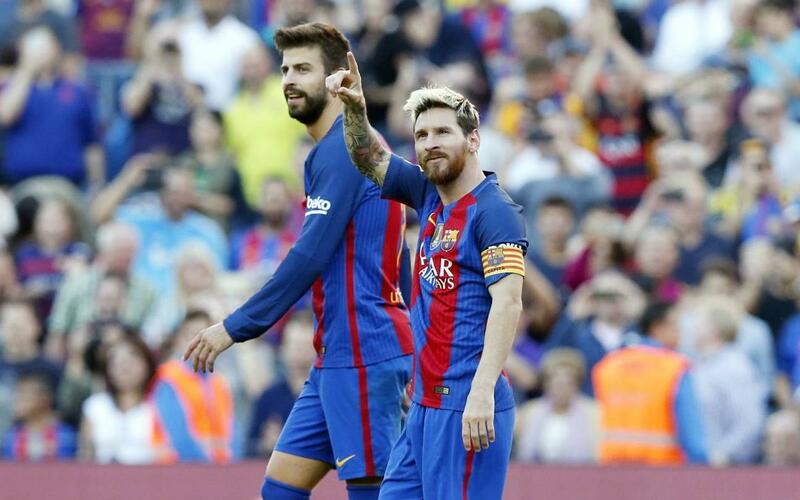 Lionel Messi made an emphatic return to action on Saturday afternoon at Camp Nou, scoring Barça’s final goal of the day in the 58th minute to put an exclamation point on a sterling all-around team performance and a 4–0 La Liga victory over Deportivo La Coruña. In Barça’s first game following yet another international hiatus, it was the midfielder Rafinha who got the Catalans off to the start they needed, notching a pair of first-half strikes while Luis Suárez added a third before halftime. Rafinha’s two goals were his 3rd and 4th of the season in La Liga — tying him in that department with Neymar and a handful of others for third most in the league — and they gave Barça a huge lift in a highly vital game, the first in a string of six challenging fixtures over a 22-day period. But while Rafinha ruled the stat sheet on Saturday, it was Messi who commanded the stage. The Argentinian striker, who was making his first appearance in 24 days and started the game on the bench, came on for Sergio Busquets ten minutes into the second half and wasted no time extracting a pair of thundering ovations from the Barça faithful. The first was when he stepped onto the field, just over three weeks after injuring his groin in a 1–1 draw with Atlético Madrid on 21 September. The stadium shook as Messi took the captain’s armband from Busquets and Velcroed it over his sleeve. The second, and bigger, round of applause came just three minutes later, in the 58th, when Neymar threaded a pass into the area that Messi superbly finished in the most Messi-esque of fashions, with a magnificent, on-the-run chip shot over the goalkeeper’s helplessly flailing arm, capping the scoring to seal Barça’s 4–0 triumph. The final score was particularly notable given Deportivo’s propensity for being a tough nut to crack. The Gallegos managed to coax a pair of 2–2 draws out of their last two visits to Camp Nou and had boasted the league’s stingiest defense thus far this season. Following a smattering of succulent scoring chances for both Neymar and Suárez in the opening quarter hour, the game’s first goal would become a reality in the 20th minute, when Rafinha cut off a Deportivo outlet pass and improvised a quick give-and-go with Suárez, finishing with a blast that went straight through Depor keeper GermánLux. The Catalans dictated play through large stretches in the first half, with Blaugrana goalkeeper Marc ter Stegen often the only player on the field standing in the Barça half. Rafinha punched in his, and Barça’s, second goal of the day in minute 36. After a long free kick from Neymar and a header from Gerard Piqué that was slapped away by Lux, Rafinha pounced, thrashing from the seat of his pants to bang home the rebound for a 2–0 lead. Suárez made it 3–0 in the 43rd on a beautifully coordinated combination with Neymar, using his body to shield a lone defender in the penalty area and receive the low pass before pivoting towards the goal and finishing with aplomb. Suárez fired a low rocket square off the post in the 45th, eliciting a collective ooh from the 83,553 in attendance. It was a dramatic prelude to the half-time whistle that would signal the intermission just moments later. Paco Alcácer came in for Suárez at the half and, minutes later, Messi made his return to action, followed by his quintessential chip. Following Messi’s goal, and with the scoreboard reading 4–0, Neymar, the most oft-fouled player in La Liga with 26 fouls received coming into the game, was felled along the sideline with a hard elbow to the jaw in minute 65, sending Deportivo’s Laure off with a straight red card and allowing Barça to play up a man for the last 25 minutes. In the 72nd, Alcácer, still looking for his first goal of the season, was generously set up by Piqué but, with a wide expanse of net laid out before him, he buried his point-blank shot straight into the keeper’s chest.